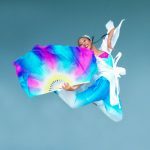 Atlanta Chinese Dance Company presents Ren and Shen: Chinese Humans and Superhumans at the Infinite Energy Theater in Duluth, GA, featuring guest artists from the acclaimed New York based Qi Shu Fang Peking Opera Company. Photo: Cheng Wu. This article is part of the Creating Place project. View the full multimedia collection here. In 1986, a group of immigrants approached my mother Hwee-Eng Y. Lee about starting a Chinese dance class for their teenage daughters in Atlanta. Living in the South – tiny specks of yellow in a world of white and black – they feared that their American bred children would lose connection to their cultural heritage. Yes, they had already enrolled them in Chinese language classes. But more school on a Saturday morning – sitting behind a desk, listening to a teacher lecture, writing pages and pages of Chinese characters – didn’t exactly inspire enthusiasm after a long week of regular school. But dance… Dance was another universe their kids already knew and loved. My mother’s first five Chinese dance students were the seeds that would form the Atlanta Chinese Dance Company (ACDC) in 1991, a now twenty-six-year-old nonprofit that has served hundreds of Chinese dancers ages four through seventy and millions of audiences over the years. They would learn and share the art of Chinese dance both inside and outside the local Chinese community, playing a pivotal role in the production of Georgia’s first formal Chinese dance and music concert in 1989 (organized by the Organization of Chinese Americans or OCA) while making appearances at The King Center, downtown Atlanta’s Fourth of July Parade, and more. Future generations of ACDC dancers would help showcase Atlanta to the world in the opening and closing ceremonies of the Centennial Olympic Games and present a culturally authentic version of the “Chinese variation” in Act II of the Atlanta Ballet’s The Nutcracker for over ten years. A snapshot of the company’s programming over the past year includes a National Endowment for the Arts funded original full-evening production, more than sixty community outreach performances, and an after school program for underserved youth in a predominately black Title I school. At the core of it, creative placemaking is about leveraging art and culture to make communities more livable. ACDC empowers our predominantly (but not exclusively) Chinese American dancers to take pride in their cultural heritage by learning Chinese culture and history through the art of Chinese dance. These dancers then share what they have learned with the general public of all ages and ethnicities through original full-evening productions as well as community outreach performances, lecture-demonstrations, and workshops for schools/universities, libraries, senior centers, museums, military bases, businesses, cultural events, and more. Working in tandem with existing community infrastructure, we enhance limited education and entertainment on Chinese dance, history, and culture in metro Atlanta and surrounding areas. Asian Americans are the fastest growing racial group in the US, and China is home to roughly twenty percent of the world’s population. Increased cultural awareness about China and Chinese Americans minimizes cross-cultural misunderstanding and cultivates a more competitive workforce in today’s global economy, improving quality of life for Chinese and non-Chinese alike. While it is all too easy for people of different backgrounds to talk past each other, Chinese dance is an inviting, multisensory medium that transcends boundaries – a stepping stone to bringing people together for deeper conversations to come. Being as my mother was ACDC’s founder and artistic director, Chinese dance has been a part of my life for as long as I remember – but it wasn’t until recently, taking on a leadership role as co-director, that I’ve begun to understand the profound impact Chinese dance has had on me, others like me, and my community. I distinctly remember walking through my elementary school hallway – a public school in the suburbs of Atlanta, where I was one of few Asian Americans among one thousand kids – and wishing I had blonde hair and blue eyes. Thanks to my passion for dance, I didn’t despise Chinese dance as much as some of my classmates did – the ones who were forced by their parents to go to Chinese dance class when they’d rather be at their high school football game. Still, I dismissed Chinese dance as inferior to Western dance forms such as ballet and modern dance. Growing up, I simply wasn’t proud to be Chinese. The opportunity to share the art of Chinese dance – to witness people from all walks of life reacting enthusiastically to something I discounted for so long – has been deeply transformative. These days my mother and I present lecture-demonstrations in schools much like the ones I grew up in. Often we’re greeted with skepticism – especially by the teachers, who are probably wondering how two petite, unassuming Asian women will be able to entertain hundreds of rambunctious kids for an hour. But then they see their students wide-eyed, mouths agape, enjoying themselves, fighting to be picked for audience participation – and they tell us afterwards that they’ve never seen their students so engaged. I’ll admit, at first I was skeptical too – especially with teenage boys who tower over me. After all, Chinese cultural arts were never front and center in the schools I attended growing up. We had assembly programs in the gym and field trips to The Nutcracker and The Christmas Carol, but my entire grade or school never gathered together to have a shared experience appreciating my traditional culture for an hour. When I step back and reflect on the opportunities I now have to co-lead such experiences, my heart swells with pride. And I hope young Chinese Americans who sat where I once sat, watching their classmates cheering like crazy for their traditional culture – something maybe they feared their classmates would find weird – might feel a twinge of pride too. Atlanta Chinese Dance Company presents a lecture-demonstration on Chinese dance, history, and culture at Peeples Elementary School in Fayetteville, GA. Photo: Hwee-Eng Y. Lee. 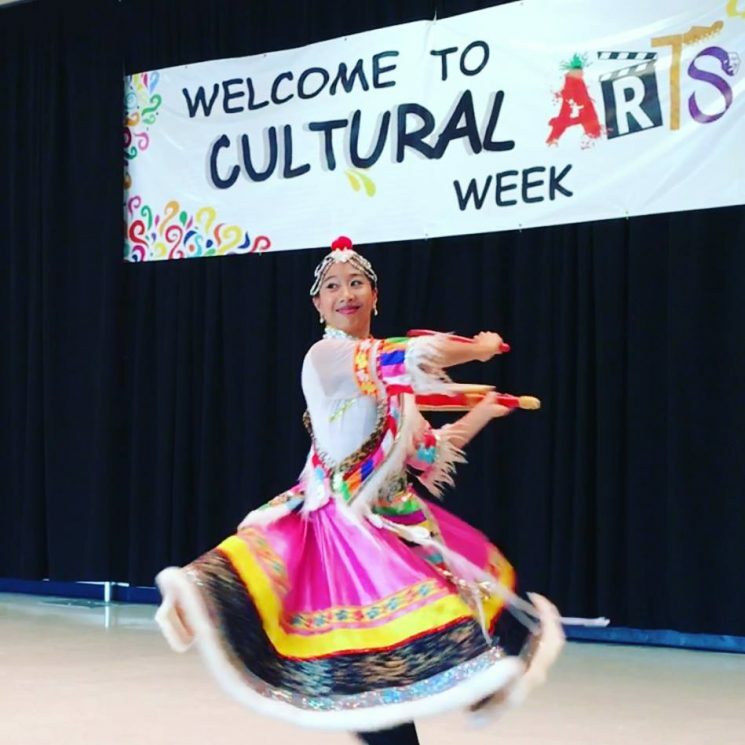 That being in a room full of kids with black hair was noteworthy to this little girl underscores the role ACDC plays not only as a place to learn Chinese dance, but in creating a sense of belonging for those who look very different from the people they spend the most time with. ACDC would be a second family for this dancer for thirteen more years – from kindergarten through high school graduation. Some of her younger classmates, now in college, are among ACDC’s leading dancers today. Beyond serving our dancers, ACDC fills a void in the lack of education on Chinese history and culture in Georgia. When I was in seventh grade social studies class, I remember looking forward to the chapters on Chinese history only to be disappointed when the curriculum turned out to be very shallow compared to that of the US and Europe. As a professional dancer with the Nai-Ni Chen Dance Company and H.T. Chen & Dancers in New York, we often performed for third graders because that was when they studied China. But when I researched K-5 social studies standards in Georgia, I was astonished to discover that China was nowhere to be found. In Georgia, a child can conceivably graduate from elementary school knowing next to nothing about the country with the largest share of the world’s population, GDP second only to the US, nearly the largest share of the world’s land area, and one of the longest histories in the world. Much of what I know about Chinese history and culture, I learned through Chinese dance. When ACDC presents lecture-demonstrations – for audiences as young as 0-8 at the Children’s Museum of Atlanta, at senior centers, and for everyone in between – we utilize the art of Chinese dance to represent some of China’s 56 ethnic groups, 5,000 years of history, and vast geographic diversity. Opening with a dazzling, colorful yangge celebration from the Han ethnic majority, audiences experience an energetic reba drum dance performance from the Tibetan ethnic minority in the Himalaya Mountains, learn some shoulder shrugging moves originating from nomads of the vast grasslands of Inner Mongolia, travel back in time to observe the elegant headdresses and huapen platform shoes worn by the Manchurian court ladies of the Qing Dynasty, and more. Those who join us for our original full-evening productions in the theater are in for a much larger visual feast. Featuring a cast of nearly 100 dancers and professional guest artists from New York in 200+ sets of elaborate, authentic costuming and props from China, each production is centered around a story or a theme – such as China in Transition: Animal Folklore to City Life (2016), Ren and Shen: Chinese Humans and Superhumans (2015), Chinese Painting in Motion (2013), and so on. Each year we introduce a new element of Chinese dance so that audiences who return time and time again learn something new each time. Much like the US, China is a very large and diverse country. Even China natives often do not know much about the areas they have never traveled to. Last year someone commented that the dilapidated houses in a background image no longer exist in China, but his friend countered that his home province still looks like that! 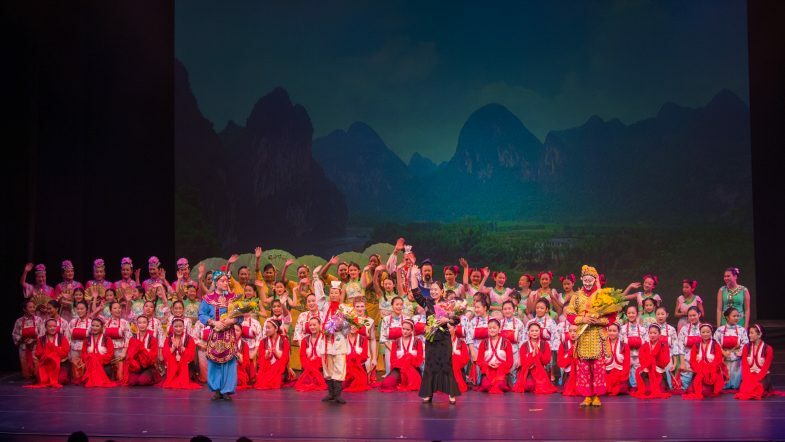 In today’s increasing polarized environment, where China is viewed as an economic competitor and immigrants (and American born children of immigrants) are often demonized as “other,” Chinese dance is a universal artistic language to connect with our friends and neighbors. It is a reminder that despite our physical differences, we share a lot in common as fellow humans. 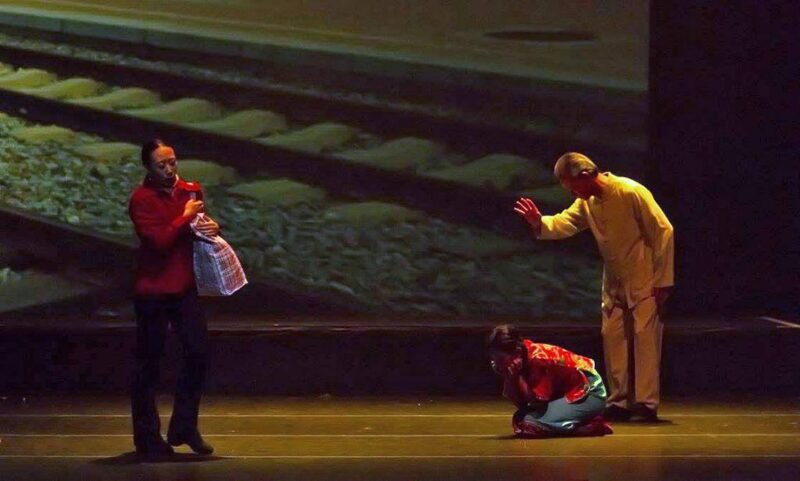 Atlanta Chinese Dance Company presents a mini dance drama about China’s migrant workers and their left-behind children at the Infinite Energy Theater in Duluth, GA. Photo: Christine Zahniser. A few years ago I was in a planning meeting for a community event commemorating the 150th anniversary of the American Civil War, where ACDC would perform an excerpt from one of our productions. The facilitator surveyed the room for native Atlantans. To everyone’s surprise (including mine), I was the only one who raised my hand. Yes, the Asian one was the only native Atlantan in the room. In that moment, I realized that I am just as American – just as Southern – as the white and black people in the room. My traditional art and culture – as well as that of all ethnicities in the Global South – are an invaluable resource in making our communities a better place for all.